Pearl One whom is precious. Each one of us can look back on our lives and remember the people that have influenced us in a positive way. My biggest influence in life was my Granny Pearl. Granny is the person that not only raised me, but taught me to love and care for the world around me and all of its' inhabitants. My happy childhood memories of her are filled with music, stories, games, pride, play, spirituality, and hugs. She was one of the most interesting people that I have ever known. She is my role model and my inspiration, even though she left this plane of existance several years ago. mason jars at the "honky tonk" where her Mother worked at as a waitress. caring for a disabled young girl, who became like a sister to her. her and the young girl rode in the back of the wagon, as usual. now she was on her own again. and many other things that we take for Granted (such as a refrigerator). Luckily, she was an incredible cook. This allowed her to have job security. Finally, she found a more stable life. my Grandfather, whom she married and had seven children with. None of her children were delivered in a hospital as it was not an option for them at the time. 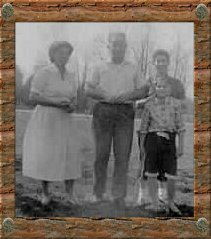 The new family survived as share-croppers, raising tobacco and their own food. She learned how to be efficient and how to make use of everything. there. These gifts were passed onto me. during the 1950's, she was presented with a baby girl to raise (Me). of my parent, mentor, spiritual guide, and angel. as good table manners and to always wear clean underwear. illness was not diagnosed until it was at an inoperable stage. to extend her life a bit longer. It was a very painful time for her. During the last of her life, I quit school, and moved in to care for her. I found out that she still had much to teach me and our bond grew even more. She was afraid to sleep at night in case that she would die in her sleep. So, I spent each night listening to stories of a life gone by. not only as my Granny, but as a special person. finishing university, falling in love, my marriage, me as an adult. life and be a good person for I know that we will meet one day again. "Remembering Mother, Finding Myself -- A journey of Love and Self-Acceptance"
I was blessed to have my Grandmother and for her spirit to still be with me. Pearl is my Guardian Angel, and she visits me in my dreams and speaks to me. to hug her, but I know that she will always be with me, and watching out for me. I'm as big for me, as you are for you! and they are and have always been entwined. We are drawn to the same souls each lifetime..in different forms. "My Little Lonesome Dove was sent to me for a reason...to love again."